Every other Tuesday, a few men from church come over to our house for breakfast at 6:00 a.m. It is mostly just a time for them to encourage each other, share about what the Lord is teaching them and a time for fellowship. My husband was part of a mens breakfast at our previous church and really felt that had a positive impact on his spiritual life while building some lasting friendships that have lasted despite our move. I tried this recipe for the first time with great results! It made over 20 scones for me so I am considering freezing some for another such breakfast. 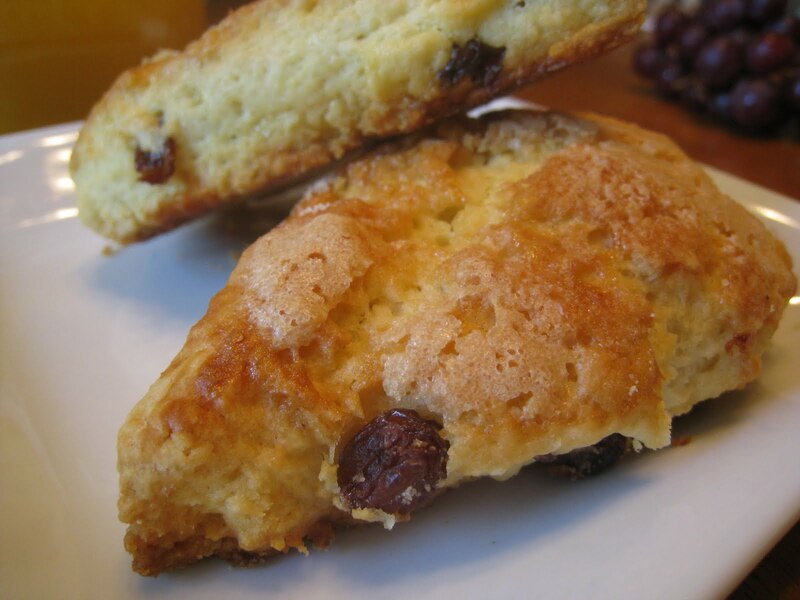 The guys had spinach and ham egg casserole, fruit, juice and coffee to accompany these yummy scones. Combine 4 cups flour, 2 tablespoons sugar, the baking powder, and salt in an electric mixer fitted with a paddle attachment. Blend in the cold butter at the lowest speed and mix until the butter is in pea-sized pieces. Combine the eggs and heavy cream and quickly add to the flour/butter mixture. Combine until just blended. Combine the raisins and 1 tablespoon flour and then add to the dough and mix quickly. The dough may be a bit sticky. Dump the dough out onto a floured surface and be sure it is well combined. Flour your hands and a rolling pin and roll the dough out to 3/4-inch to 1-inch thick. You will see lumps of butter in the dough. Cut into squares with a 4-inch cutter and then cut in half diagonally to make triangles. Place on a cookie sheet lined with parchment paper. Brush the scones with the egg wash and sprinkle with sugar. Bake for 20 to 25 minutes until the outsides are crisp and the insides are done. Note: The fruit could be substituted for anything you like. I personally think dried currants or dried strawberries would be a great substitution! >This looks wonderful! I'm eager to try them! >Thank you for feeding my husband – he has been blessed this summer! Looks delicious!